SCVHistory.com LW3214 | People | James J. Jeffries, Prizefighter & Saugus Gunpowder Manufacturer, 1910. Hassan tobacco card, 2½x2¾ inches. Tobacco cards came in packs of cigarettes, similar to later bubble-gum cards. Pugilist James J. Jeffries was the earliest known predecessor to the Bermite Powder Co. in Saugus. Nicknamed the Boilermaker, Jeffries (1875-1953) was the heavyweight champion of the world from 1899-1904. He seized the title with an 11th-round knockout of reigning champion Bob Fitzsimmons in Brooklyn on June 9, 1899. He defended his title seven times, including rematches with Fitzsimmons and Tom Sharkey, and two challenges from Gentleman Jim Corbett. 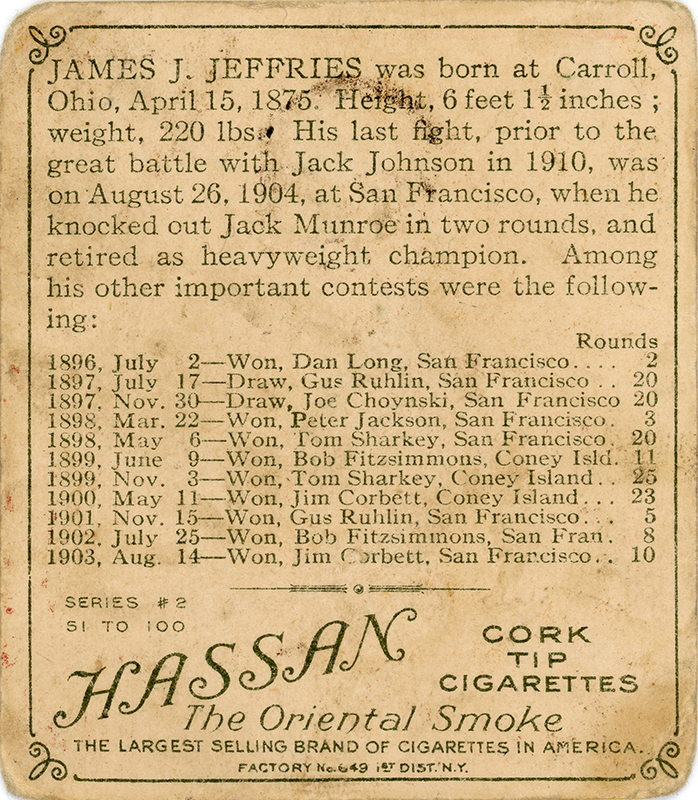 Jeffries was one of the few prizefighters to go out on top when he retired in May 1905. But then he made the fateful decision in 1910 to try a comeback against then-heavyweight champion Jack Johnson. Jeffries, now 35, was billed as the "Great White Hope" in this hugely promoted bout. He was knocked unconscious in the 15th round by Johnson, who was black. It was the only loss of Jeffries' career, which counted 18 wins, 15 of them by a knockout, and 2 draws. Afterward, Jeffries tried his luck at several business ventures. He owned a bar and a farm in Burbank where he bred prize cattle. In 1917, as the United States was entering World War I, James and his brother Jack were the heads of the new Los Angeles Gunpowder Co. and possessors of a secret formula of high-grade gunpowder that they were manufacturing in Saugus. "The plant at Saugus was established about nine months ago," brother Jack told reporters in March 1918. "We are using material dug out of the hills, and the result is a splendid grade of smokeless powder." It was reportedly suitable for "shotgun shells or other forms of ammunition requiring a bulk powder." By 1920, the Boilermaker had dug exploratory oil wells on the Saugus property he had purchased "several years earlier," according to reports. However, it appears none of these ventures paid off. The armistice of November 11, 1918, curtailed the need for gunpowder, and there is no indication the oil wells produced. In 1923 Jeffries filed for bankruptcy protection, reporting assets of $130,000 and liabilities of $192,000. * His Burbank ranch was split up to pay off his debtors, and for a time, he went on tour with his old rival Tom Sharkey as a pair of vaudeville fighters before returning to what was left of his ranch. In later years he would train amateur fighters. 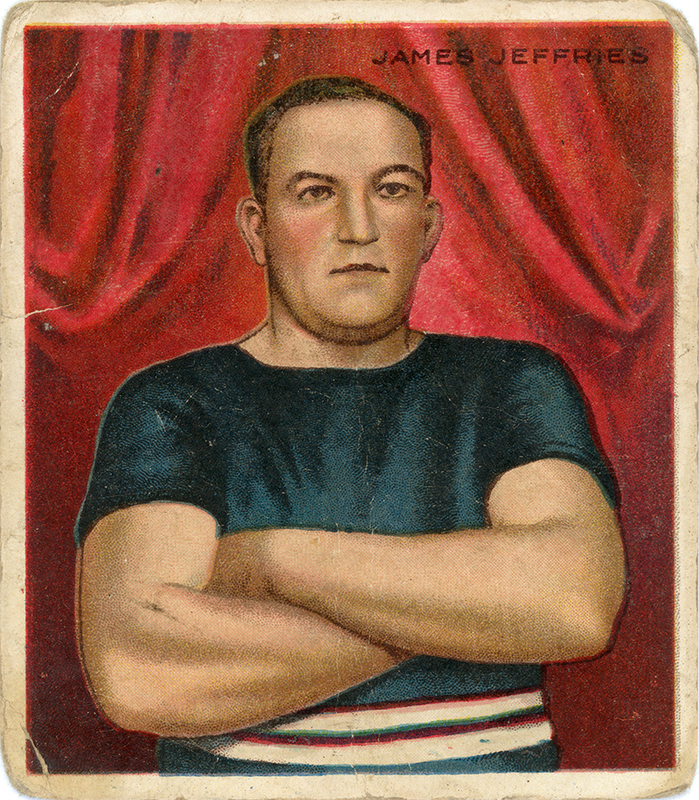 Jim Corbett echoed the sentiments of many contemporaries when he opined that James Jeffries' speed, strength and size (225 pounds) made him "the greatest heavyweight champion of them all." As for Jeffries' Saugus property, oilman E.P. Halliburton and partners picked up the ball in 1934 when they formed the Halafax Explosives Co. and set up a big, new manufacturing plant that opened in April 1935. Four years later, Patrick Lizza established Golden State Fireworks on adjacent property, while Halafax manufactured fireworks at its site from 1936 to 1942. Halafax eventually defaulted on its property taxes, and Lizza's company, as Bermite Powder, acquired the land and used it to manufacture military ordnance and other explosives until 1987 (after 1967 as Whittaker-Bermite). The combined 996-acre property is bounded by the Circle J community on the south, Bouquet Canyon Road on the west, Soledad Canyon Road on the north, and Golden Valley Road on the east. * Death notice in Sunday Herald, Sydney, Australia, March 8, 1953. 1896, July 2 — Won, Dan Long, Sail Francisco ... (Rounds) 2. LW3214: 9600 dpi jpeg from original tobacco card purchased 2018 by Leon Worden.